The plane was set for the short flight from Alexandria to Cairo, about 180 kilometers away. It landed instead at Larnaca airport in Cyprus, about 540 kilometers northeast. The hijacker, who held the plane and crew, threatened to blow up the plane, officials said. However, news sources said the hijacker said he wanted to speak to his former wife, who lives in Cyprus. The hijacker, identified as Seif el-Din Mustafa, later admitted that he did not have explosives. The president of Cyprus told local media a "domestic issue" was behind the hijacking. The hijacker's former wife was brought by local police to the airport to meet with him. After the plane landed in Cyprus, video showed passengers walking down the plane stairs to a bus on the ground at Larnaca International Airport. 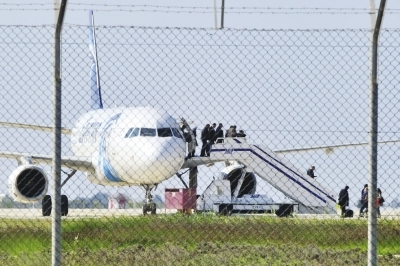 Cyprus public television reported that the hijacker was a 27-year-old Egyptian. He asked for political asylum, it said. Just before his arrest, one man was seen climbing out of the cockpit window and sliding down the side of the airplane. Egypt's civil aviation minister said security on the plane was good and the hijacker had not been able to enter the cockpit. That prevented a more serious threat, he said. Egyptian TV showed video of a man going through a metal detector and being searched at Alexandria Airport before getting on the plane. Last November, the Associated Press reported that the airport at Sharm el-Sheikh had "gaps," or holes, in security. Gaps include "a key baggage scanning device" that often is not working. The AP also said that "poorly paid policemen monitoring X-ray machines" often take bribes. At that time, a spokesman for Egypt's Aviation Ministry dismissed the stories of poor security. He told AP that "Sharm el-Sheikh is one of the safest airports in the world." But, British Transport Secretary Patrick McLoughlin said that bag screening was insufficient at the airport. A retired senior official from Egypt's Tourism Ministry told AP that airport guards regularly skip, or avoid, security checks for friends and co-workers. Tuesday's hijacking will most likely damage Egypt's important tourism industry. It has already suffered from years of political unrest and a growing terror threat. An Islamic State affiliate in the Sinai Peninsula in October brought down a Russian passenger jet with a bomb planted on board, killing all 224 people on board. He tried to blow up a fire. The fire died out, instead. The horse jumped the stream and landed on all fours. 1.Egyptian TV showed video of a man going through a metal detector and being searched at Alexandria Airport before getting on the plane. Ruby was going through the preparations for the meal gently. I can imagine what is going through your head. 2.An Islamic State affiliate in the Sinai Peninsula in October brought down a Russian passenger jet with a bomb planted on board, killing all 224 people on board. Later we learnt that there was a very important person on board. That ship and all hands on board were lost on the reef.